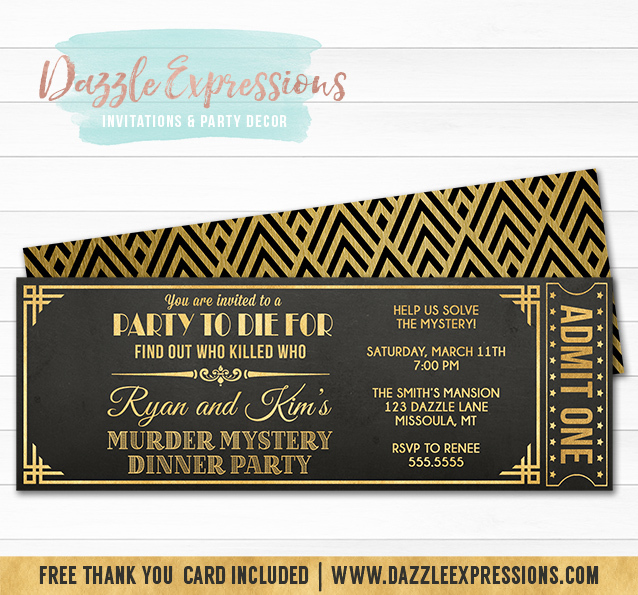 Make your murder mystery dinner party even more funwith these custom ticket invitations! You can even personalize it with your own fonts and wording. Just send me a message about what you are looking for. Note: This listing is for digital files only which will be sent to you via email. Your files will be sent to the address you provide when checking out. You will not receive anything by mail. You can print the invitation file as many times as you'd like. You will receive your high resolution invitation by the night of the 2nd day. (For example, if you order any time on Monday then you will receive it by Wednesday night.) Need it sooner? No problem! We do offer a RUSH option that is available when you checkout. For $5 you will receive your invitation in 12 hours or less. We also have many printable add ons that we can do in any theme! Check out your options here! You can add on a printable complete party package when you checkout. Please note that you will receive your invitation in the 2 day turnaround time, but that the rest of the party package will be sent within 4 days. View everything that is included in a complete party package here! 1. Add this listing to your cart and follow checkout procedure by filling out the text box form below. Be Sure to add our e-mail address to your "safe senders" list. If you do not receive your invitation after checking your spam folder in our 2 day turnaround time then please contact us right away. You will receive a proof of your design by the night of the 2nd day. If you need it within 12 hours there is a $5 charge (option available when you checkout). I will send the invitation to your e-mail address that you leave when you checkout. You will then have the opportunity to look over your proof and request any changes or approve it. You will receive the invitation and thank you card in 300 dpi high resolution. You have the option to receive your files in JPG or PDF format. JPG - To print as a photo at any photo lab be sure order the JPG option. PDF - To print on cardstock from your home printer, Staples, FedEx, Office Depot, etc. be sure to order the PDF option. Please let us know when you place the order if you plan to use an online printing place such as vistaprint, walmart, mpix, etc. as they usually require a bleed to be added.